Welcome to The Abso!ute Sound online! We explore music and the reproduction of music in the home. We believe that the sound of music, unamplified, occurring in a real space is a philosophic absolute against which we may judge the performance of devices designed to reproduce music. Our goal is to provide the resources consumers need to judge how a component's sound either honors or departs from the music's truth, and to make sound purchasing decisions that maximize their experience of reproduced sound. Below is our Issue 265, September 2016 table of contents and editorial. Julie Mullins listens to this amazing desktop Bluetooth speaker system, featuring a miniaturized version of the Uni-Q driver array inside KEF's Muon flagship. The company that reinvented personal audio players introduces its first in-ear monitor. Steven Stone has the details. 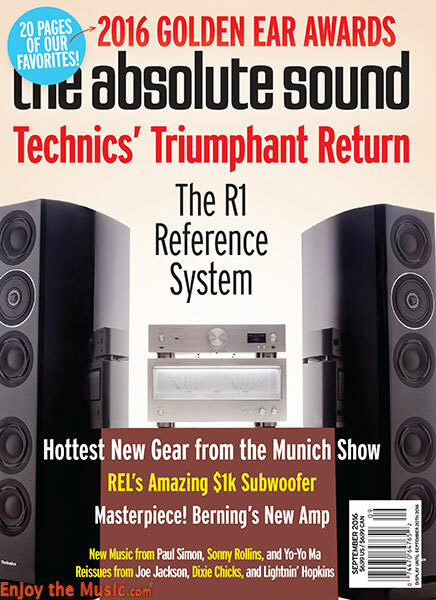 Technics has returned to the high end with the innovation-packed R1 Reference System. 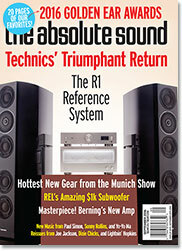 Alan Taffel reflects on the company's legacy, and assesses Technics' radical rethinking of audio system architecture. Our editors and writers pick their personal favorites. More than an MQA-compatible DAC, the Brooklyn offers a full-function preamplifier complete with phonostage. Steven Stone puts this highly capable product through its paces, and offers his assessment of MQA. Vade Forrester reports on this all-tube integrated from Rogers High Fidelity. Neil Gader finds much to like in the revamped Frey 2 from Nordost. These sophisticated vibration-dissipation products can significantly improve the sound of just about any system, says Jacob Heilbrunn. Subwoofer specialist REL introduces an affordable sub that not only delivers low bass, but seamlessly integrates with your main speakers. Neil Gader reports. Don Saltzman evaluates this innovative new 300Wpc integrated amplifier from Michael Børresen of Raidho fame. With 60W of Class A triode power, no output transformer, zero feedback, and a switch-mode power supply, the Berning 211 / 845 breaks new ground in amplifier design — and musical performance — says Robert Harley. Andrew Quint interviews "the hands-on chanteuse." Greg Cahill recommends 15 essential neotraditionalist country albums. Andrew Quint reviews hi-res classical downloads. New music by Paul Simon, Sarah Jarosz, Bob Mould, Sturgill Simpson, Yo-Yo Ma & the Silk Road Ensemble, Chris Robinson Brotherhood, Sam Bush, and Bryan Sutton, plus reissues by Joe Jackson, the Dixie Chicks, Lightnin' Hopkins, and Piero Umiliani. Piano concertos by Prokofiev, Schumann, and Tchaikovsky; overtures by Weber; piano works by Henrique Oswald; Pablo Villegas' Americano; and three "after" concertos by David Canfield. New releases by Sonny Rollins, J. D. Allen, Matt Wilson, Snarky Puppy, Ferit Odman, and Frank Kimbrough, plus a Booker Ervin reissue and Mosaic's Classic James P. Johnson Sessions (1921–1943). We talk with Tony Brady, Chief Engineer, Exposure Electronics Ltd.